Instructions: Card base size is 5 x 6". Cut white cardstock to 10 x 6", score and fold at 5" on the long side to create a 5 x 6" top fold card base. Cut two pieces of paper from the Cherry Blossom Retreat paper collection 4 7/8 x 5 7/8". Ink the edges with Pearlescent Coral ink and adhere one to the card front and one to the inside. Cut paper from the collection 2x 4 3/8 x 3 1/8" - 2x 3/8 x 4 3/8" and 2x 3/8 x 3 1/8" to cover the 3 1/4 x 4 1/2" shadow box. Use the Cut Mat Create 1A die to cut the opening in the front. Ink all the edges with Pearlescent Coral ink and adhere to the shadow box using dries clear adhesive. Diecut the decorative die from the Daydreams Bridge set from white cardstock, sponge with dries clear adhesive and sprinkle with Rajni Chawla's Crystal Clear glitter. Stamp the wishing well on white cardstock using Archival Shadow Gray ink and color with Prismacolor Pencils and blend using Tombow Dual Marker Blender and odorless mineral spirits. Diecut using coordinating die. Diecut three more times from white cardstock and adhere the layers together to form a stronger diecut. Spritz with Sheer Shimmer Spritz - Sparkle. When dry, lightly dab with dries clear adhesive here and there and sprinkle with Transparent Ultra Fine crystal glitter. Adhere to the inside of the shadow box using dimensional dots. 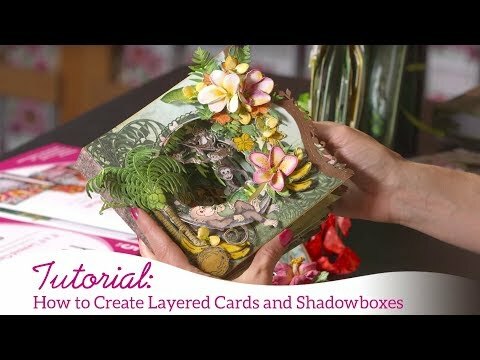 Add a cherry blossom and leaf cluster to the decorative die next to the shadow box. Using a sponge, dab dries clear adhesive randomly over the card and sprinkle with Transparent Ultra Fine crystal glitter. You can never have too much glitter!